In an effort to clean out my magazines and cookbooklets, I joined Magazine Mondays hosted by Cream Puffs in Venice many years ago. What I really like is that she isn't strict about when you post so I can publish these yummy results as I find them. I have this horrible habit of cutting recipes out and throwing them into a box and then I have no idea where the original recipe came from. To be honest it didn't help me eliminate recipes, but I enjoy it anyway. I've ended up with multiple recipes and they are ALL good so just pick your favorite from this bunch! 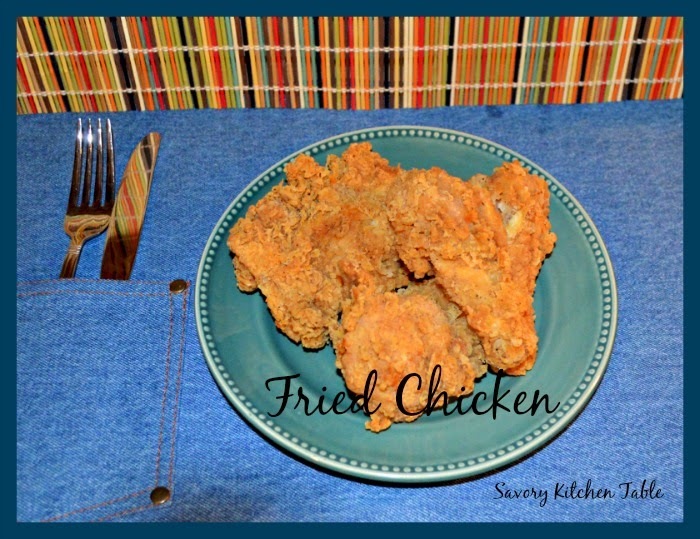 Both of these recipes make a chicken where the crust doesn't break apart on the first bite. Bring oil to frying temperature in a cast iron skillet. Wash chicken pieces, dry and sprinkle with salt. Whisk together the beer, baking soda and salt. Dip each piece of chicken in beer mixture and then fry. In a very LARGE bowl combine the 3 cups buttermilk, kosher salt and sugar, stirring to dissolve. Add ALL the chicken pieces, turning to make sure each piece is coated in brine. and seal tightly. Chill 3-4 hours, turning occasionally to make sure chicken pieces are well coated in brine. Remove from brine and dry on paper towels. Discard brine. Heat large skillet with 1 1/2 inches of oil to 350 degrees. OIL WILL BE HOT!!! USE CARE!! Whisk together the eggs and 1/2 cup buttermilk into a shallow dish. Combine flour, sea salt, white pepper and paprika in a large Ziploc bag. Divide into 2 shallow dishes. Dip each chicken piece in the first flour dish, then the egg dish and then the 2nd flour dish. Add chicken pieces, adjusting as necessary to maintain heat. Cook 12-15 minutes until golden brown turning only once when you see blood as grams would say. NOTE: LET YOUR USED OIL COOL AND THE STRAIN IT INTO A GLASS MASON JAR. REFRIGERATE AND IT CAN BE USED 2-3 MORE TIME IN THE THE NEXT SEVERAL MONTHS. BE SURE TO STRAIN IT EACH AND EVERY TIME! SIZE DOES MATTER. Try to cook pieces similar in size at the same time. DO NOT CROWD YOU PAN. Cook in batches allowing plenty of room for the oil to make your crust crisp. BUTTERMILK BRINE: Buttermilk brine on chicken as well as beef acts like an enzyme to break down muscle fibers and fat allowing more flavor to be tasted in the finished product. ROOM TEMPERATURE! Bringing your pieces to room temperature before the wash and dredge does 2 helpful things - 1) your oil will not cool as much or as fast giving you an even cooking and 2) your wash and dredge will stay put better making a crispier chicken.